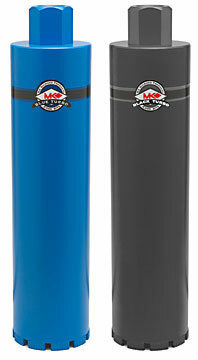 MK Diamond 4-1/2" (114mm) Black Turbo Supreme grade for hard aggregate with heavy steel. The high diamond concentration and segment design of these bits provide better channeling of slurry, reduced vibration and superior performance in concrete with heavy steel. MK turbo bits provide for better channeling of slurry and reduced vibration when drilling in concrete with steel.